Overlooking the West Coast Nature Reserve, this beautiful guest house offers outstanding views over Schaapeneiland and the Langebaan Lagoon, with incomparable birdwatching opportunities. This stunning accommodation has five bedrooms and is superior in comfort and quality, with a high standard of furnishings and service. The bedrooms are very comfortably furnished with a tea tray, a fan, underfloor heating, a large shower and three of the rooms have a spa bath. Laze next to the swimming pool or explore the area. There is a television in the lounge for all the guests to use. We serve a very substantial continental breakfast, and it is a pleasure to sit and watch the duikers pass the house in search of food. There are also dassies on the rocks and if you go for a walk, you may come across a tortoise or two. The birdlife is abundant, even from the house, but the lagoon wetlands is a renowned birdwatching spot. There is a footpath from the house down through the veld to the lagoon and town centre, and it takes about 20 minutes to walk. If you prefer to drive to the shops, it will take you about seven minutes. There are bicycles at the guest house for guests' use. We can recommend a number of restaurants in Langebaan for lunch and dinner. Other activities include horse riding, walks on the beach, and water sports such as windsurfing or kitesurfing. Loved the room, the view, the breakfasts, the girls in the kitchen and Michelle for her help. I love the rooms and also the warm welcome by the Owner of the Guest house, their set-up. I'm surely going back.Thank your for everything. A little gem overlooking Langebaan. The breakfasts are delicious and plentiful. Highly recommended!!! 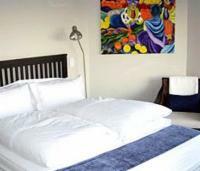 At the Rocks Guesthouse is 0.2km from the centre of Myburgh Park , the nearest airport 114.7km (Cape Town International Airport).